"My comment was misunderstood. I respect the constitution and believe that it is supreme. If, however, my statement has hurt anyone's sentiment, I have no problems in apologising for it," Anantkumar Hegde said in the Lok Sabha. Anantkumar Hegde, 49, is the Minister of State for Skill Development and Entrepreneurship. Union Minister Anantkumar Hegde apologised in parliament today amid protests over his comment that his party, the ruling BJP, will "soon change the Constitution," which mentions the word "secular." The opposition protested loudly in Parliament for a second, disrupting both Houses as they demanded that Mr Hegde be sacked. "My comment was misunderstood. I respect the constitution and believe that it is supreme. If, however, my statement has hurt anyone's sentiment, I have no problems in apologising for it," Mr Hegde said in the Lok Sabha. He had earlier told reporters, "I want to assure my friends that the Constitution is supreme to me, Parliament is supreme to me." The government had distanced itself from Mr Hegde's comments yesterday, with union minister Vijay Goel telling the Rajya Sabha, "The Government does not subscribe to views expressed by Hegde." It did not placate the Congress, which continued to disrupt Parliament on Wednesday and protested at the Gandhi statue in Parliament house this morning. 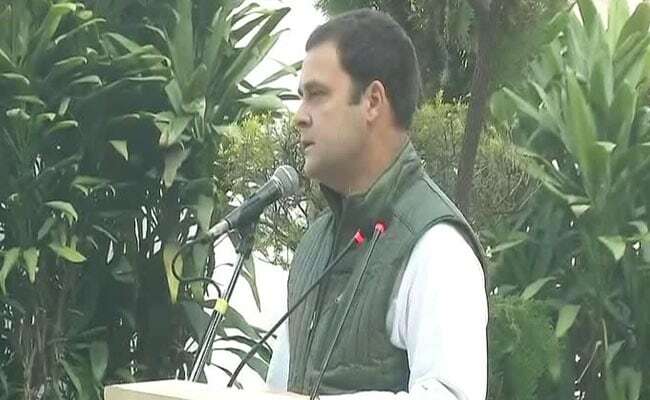 At a function to celebrate his party's foundation day, Congress president Rahul Gandhi accused the BJP of attacking the country's Constitution. "The country's Constitution is under attack by the BJP. It is our duty to defend it," Rahul Gandhi told Congress workers and leaders at the function in Delhi. Rahul Gandhi accused the BJP of attacking the country's Constitution. "People should be aware and careful as they have threat from their own government and not from any outside source," said Ghulam Nabi Azad, who is leader of opposition in the Rajya Sabha. On Wednesday, Opposition members had gathered around Rajya Sabha Chairman Venkaiah Naidu's chair and shouted slogans of: "Baba Saheb ka yeh apmaan nahin chalega (this insult of Babasaheb will not do)," accusing Mr Hedge of denigrating Babasaheb Bhimrao Ambedkar, the chief architect of the constitution. "Some people say the Constitution says secular and you must accept it. We will respect the Constitution, but the Constitution has changed several times and it will change in the future too. We are here to change the Constitution and we'll change it," Anantkumar Hegde, the 49-year-old Minister of State for Skill Development and Entrepreneurship, had said on Sunday at a function in his home state Karnataka. Mr Hegde, a five-term Lok Sabha lawmaker from the Uttara Kannada constituency in Karnataka, joined PM Modi's council of ministers in a reshuffle in August as the BJP sought to give more representation to states where assembly elections will be held soon. Karnataka votes for a new government next year and the bJP hopes to win the state back from the Congress. He has been caught in several controversies over provocative comments.